The first ten Neanderdad Tales are included in this beautifully illustrated collection of Neanderdad stories, including Neanderdad Explains Christmas, perfect for this holiday season. Great for Dads of all ages! There is a time when a hunter must go hunting. This was that time for Neanderdad. He needed to get out to the office and slay a mammoth. He was dressed for the hunt. He had prepared. A conference room full of colleagues awaited his arrival. But, alas, Neanderdad simply could not get out of the house. The monstrous waves broke violently in front of Neanderdad’s offspring, half blocking the horizon, shaking the ground and causing the air to shudder. 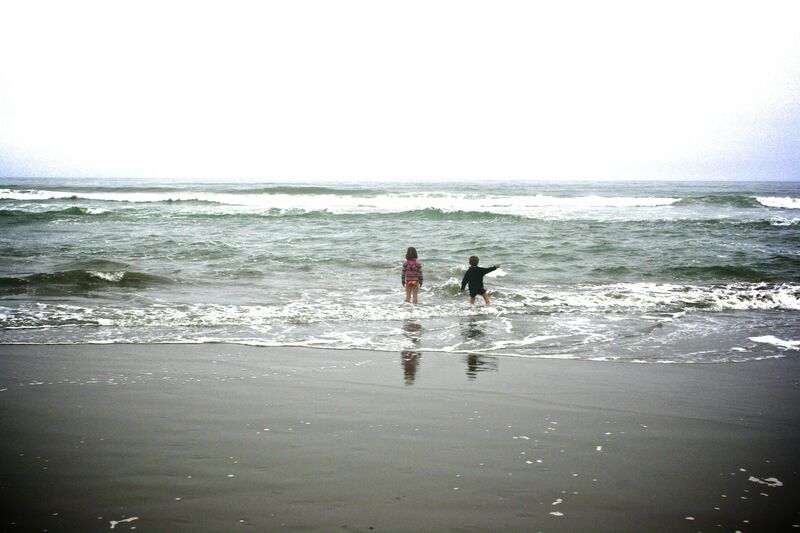 The children darted forward and retreated before the tumult, two tiny, shivering imps daring a beastly sea in flowered swimsuits. Behind them, forgotten, lay the warm, dry beach, their towels and Neanderdad. Despite his entreaties, the children eschewed him—and safety—to stand instead in the path of these seething, lunging mountains of ocean. Neanderdad was three monsters that day. That was more than usual. Playing one monster during the course of the day was actually quite normal. In fact, even two monsters was quote common for Neanderdad, for what child doesn’t like to be safely frightened? But three monsters were a lot. And in the end, three monsters were too many. The first monster was a Fort Monster. The children hid in the fort they had built with pillows and a chair. Neanderdad the Fort Monster menaced them from the carpet beyond—the carpet being the magical barrier that blocked him from tearing the flimsy affair down with one swipe of a meaty paw. Occasionally, when Neanderdad had growled off away from the fort, one or both of his offspring would peek out from the fort to confirm his separation then dash out into the open to grab something of value, like perhaps a cherished toy. Neanderdad would then turn suddenly, ‘notice’ them, roar loudly and chase them. The children would scream in imaginary fear and run back to safety. Neanderdad would stop at the flimsy walls of the fort. It was covered in magic monster repellant, of course. Then he would howl in frustration at missing the chance to eat them. The children would laugh uproariously and taunt him from the safety of their keep.